The Conway Ensign may still be worn but there are strict rules. - The yacht must be registered in Great Britain either under Part 1 of the Merchant Shipping Act or under the Small Ships Register. - It must be owned by an ex Conway cadet. - You must belong to The Conway Club Cruising Association (Annual subscription £5; Joining fee £10). - You must wear the Conway Ensign and Burgee together. Full rules and Burgees are available from the Hon. Sec. Ensigns are available from the Ensign Flag Co. Ltd., Liverpool. The Conway Merchant Navy Trust maintains the same objectives as the Conway and offers full sponsorship to a limited number of young men and women each year who become 'Conway Cadets' to train as Deck or Engineer Officers. The Trust is a registered charity and is run with the co-operation of the Chamber of Shipping of the UK. The Trust is governed by a Board of Trustees some of whom are Conways whilst others are drawn from the shipping industry. The site is well worth a visit: http://www.conwaymntrust.info. It also provides support to poor and distressed Conways. Applications are welcomed from the progeny of Conways. Details can be found on the appropriate page of this site. A Conway Ensign hangs behind the High Altar. Many Conways are always represented at this annual commemorative service. The connection with the Canadian Navy now continues through a link with the Canadian Coast Guard College. Thanks to the initiative of several people, including an Old Conway, Captain Eric S. Brand who died in Ottawa in 1991 in his 96th year, some Conway medals and trophies were transferred to the Canadian Coast Guard College in Sydney, Nova Scotia, when Conway was finally closed in 1974. He was very keen that it should not be just the Queen's Gold Medal but the Queen's Conway Gold Medal. "It is Our wish in the establishment of this prize to encourage the Officer Cadets to acquire and maintain the qualities which will make the finest officers. These consist of cheerful acceptance of direction, self-respect and independence of character, kindness, and protection of the weak, readiness to forgive offence, desire to conciliate the differences of others, and above all, fearless devotion to duty, and unflinching truthfulness." This worthy and proud Conway tradition now lives on in a Canadian maritime context. Named after Vice Admiral Sir C. W. R. Royds (90-92) who was Scott"s First Officer on the RMS Discovery during his first Antarctic Expdition. This is also the location of Shakleton"s hut. Cheshire County Council now own the 'new block' built at Plas Newydd. It is still used by them as a residential centre for pupils from Cheshire and many othe counties. Their web site has photos of the Nelson Centre and dock. "Signed Up To Another 30 Years" Hundreds of thousands of Cheshire schoolchildren will continue to enjoy the future benefits of the arts, environment and outdoor pursuits at the county council managed Conway Centre on Anglesey. Cheshire County Council has just concluded six years of negotiations with the National Trust to secure a 30 year lease on the Centre, believed to be the largest residential service of its type run by a UK local authority. Surrounded by 169 acres of parkland the Conway Centre offers a range of courses and opportunities for junior school pupils and secondary education students. A 50 strong team offers a wide range of courses in the Arts as well as Field Studies and Outdoor and Adventurous Activities. These range from kayaking and sailing, to mountain walking, rope work and gorge walking. They also provide management training courses for adults. Over the last 30 years a half million schoolchildren and young people have benefited from visits to the Centre and the agreement to a new 30 year lease means the valued amenity will continue for the benefit of a similar number of Cheshire youngsters. Facilities at the Centre are to be improved by new building work creating additional bed space and more flexible accommodation arrangements for smaller groups of visitors. The painting of the Ship still dominates the entrance and along with the plaques and inscriptions serves as an ongoing reminder of the former days. This has been created in Birkenhead Priory http://www.vwlowen.demon.co.uk/wirral/priory.htm an old 12th century building by the River Mersey near where the Conway ships were moored from 1859 to 1941. 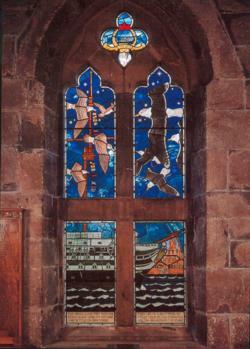 The window of the Chapel reflects the loss and passing of all Conway Cadets. The Priory museum is open Friday, Saturday and Sunday afternoons. OCs can obtain access at other times by contacting John Southwood tel: 0151 342 5978 or jrs@riverdee.freeserve.co.uk, Derek Parfect tel: 0151 653 5665 or Haydn Lockwood tel:0151 625 5727. The Kelly College at Tavistock, Devon, UK was founded in 1877 by Admiral B M Kelly. Conway House opened in 1977 was funded by the Conway Club as a result of their Centenary Appeal. The Conway Club also has a bursary at the school open to the progeny of OCs. Details can be obtained from the Hon Sec of the Club. There is a small exhibition of Conway memorabilia including a sword, the brass name plate HMS Conway from the starboard gangway and other memorabilia. The house pupils have recently taken to singing the Conway Song (this news has met with mixed views from OCs. The general re-action though seems to be positive - at least the association with the Conway and the words of the song are surviving). Awarded annually by the local Conway Club to the top cricket team of King George V School, Hong Kong. Vancouver Maritime Museum has a Conway Bar with a plaque listing all Canadian OCs. A painting of the ship is on permanent exhibition in the museum. Close by Manchester Airport is a large housing estate with road names taken from North Wales towns. 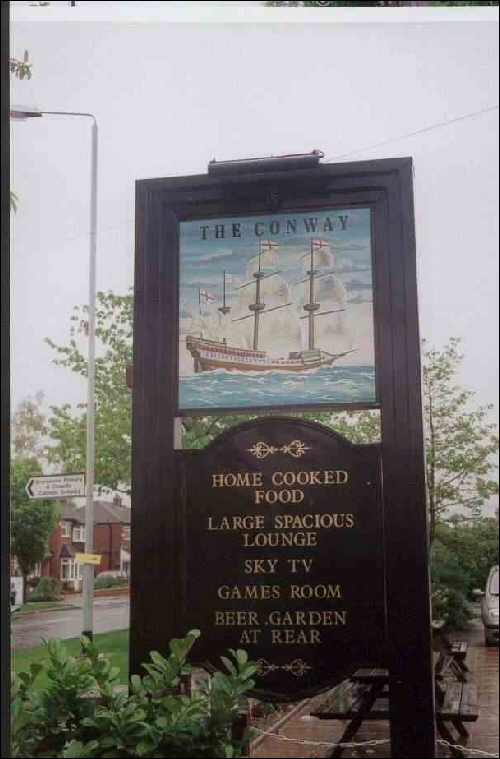 The local pub is called 'The Conway' and has a sailing ship on it's inn sign so it is named for the ship not the town. 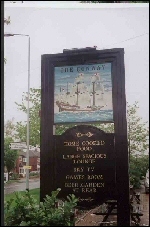 This bears no resemblance to the real Conway, there is nothing inside the pub (1997) relating to the ship and the landlord had no idea what 'The Conway' was. However the name perpetuates the ship. Maybe we should sponsor an inn sign with the ship rather than some nondescript medieval vessel as currently depicted. This is a section of Conway"s taffrail, heavily varnished and mounted on four pillars. The base has a silver plaque bearing the Conway crest. It was taken to Canada by Capt HV Todd (17-18) and eventually obtained by D MacKay (15/18) who turned it into the "Conway Trophy" . Presented annually to the Cadets of HMCS Venture, HMC Dockyard, Esquimalt BC. since 1955 to the most proficient Division in Seamanship, Signalling, and Boat Work but more recently with greater emphasis in sports. Some 300 cadets complete every year. Capt David John Austin (52-54) died during a cricket match in the Faulkland Islands in 2001. He was manager of the port at Stanley. A cricket match is to held in January of every year in his memory, with the Trophy as the prize. The city of Bristol founded this scholarship in memory of a famous Bristolian author Frederick John Fargus alias Hugh Conway (Conway 1861-62). The figurehead is now mounted in the grounds of HMS Nelson. It can be clearly seen from the road. It serves as a reminder to modern day seaman of the Conway. This is now presented annually by the Navy League of Canada Sea Cadets to the Corps demonstrating the highest degree of proficiency in small boat handling during their Spring Regatta. As many as 300 cadets are involved in the competition. The HMS Conway Coffee Shop @ Plas Newydd. The National Trust have refurbished our old mess deck in the Nelson Block and it is now themed as the HMS Conway Coffee Shop. Click here. This is awarded (on merit, not annually) by the Conway Club, Vancouver to the Canadian Coast Guard Search & Rescue Unit that performs the most notable rescue with an emphasis on initiative, seamanship and courage. The Masefield Society, The Frith, Ledbury, Herefordshire, HR8 1LW, UK. They hold a Masefield festival in the first week of June in Ledbury, his birth place. Many Conways of Stone Frigate vintage will remember the MSODs, the one-design boats many of us spent endless hours of "fun" in. Albert Gomperts has been investigating and has tracked down the secretary of the MSOD society: Mr Ray Beer, 8 Castle Street, Bangor (phone: 01248 810 094). Apparently 14 MSODs are still in use. A total of 17 were built and the three remaining ones are in restorable condition, although one sank (weren't they supposed to be unsinkable?) off Caernarfon this year after being holed on a rock. Albert would have liked to get hold of one but you're not allowed to take them out of the area. Anyone with a spare bob or two fancy contributing to their restoration? OCs are always represented at this annual commemorative service. Awarded by the British Columbia Chamber Of Shipping. P Russell was a Conway Cadet 1939-1941. He joined Canadian Pacific Steamships on leaving Conway and dedicated 50 years service to a wide variety of BC maritime organisations. OCs participate in many services and wreath layings, including a Conway wreath at the Conway Chapel, Birkenhead, the Merchant Navy Memorial in Trinity Square and Liverpool Cathederal. Have a stained glass window commemorating the life of "Hugh Conway" the pen name for Frederick John Fargus (1861-2) a well-known Victorian author. Liverpool Sea Cadets have a TS Conway corps. Another area of British Columbia named after this OC. In 2001 the Valley became the subject of much controversy over logging and wilderness management.